A new five story 127 bedroom Travelodge hotel is being built in Lincoln (UK) using offsite load bearing cold-formed steel framing. Sigmat, a UK leader in offsite cold-formed steel framing, was appointed by main contractor RG Carter for the hotel which is due to open later this year. David Ellison, Head of Business Development for Sigmat, said: “Light Gauge steel framing is an ideal solution for projects of this type. 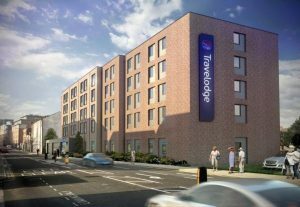 “We have a proven track record in the hotel sector and we are close to double figures for the number of projects competed so far for the Travelodge brand. “By manufacturing and assembling the panels offsite in readiness for a rapid onsite installation, we ensure that the project can get off to a flying start in terms of the final build. Cold-formed steel framing and the ability to prefabricate panels offer multiple benefits. In the U.S. and Canada, multi-family developers know that the sooner a project is completed and occupied, the sooner they can begin to generate a return on their investment. CFS helps fast track construction projects, which can help building owners begin collecting revenue sooner. For example, Poly Canyon Village, a student housing complex in California, was completed in six months less time by using CFS framing compared to the schedule for a concrete structural frame.